As soon as in 2019 the new shopping center – Galeria Chełm – will be opened by Acteeum. The special potential of Chełm and its surrounding area, a great location and an attractive mix of tenants contribute to the uniqueness of this project. 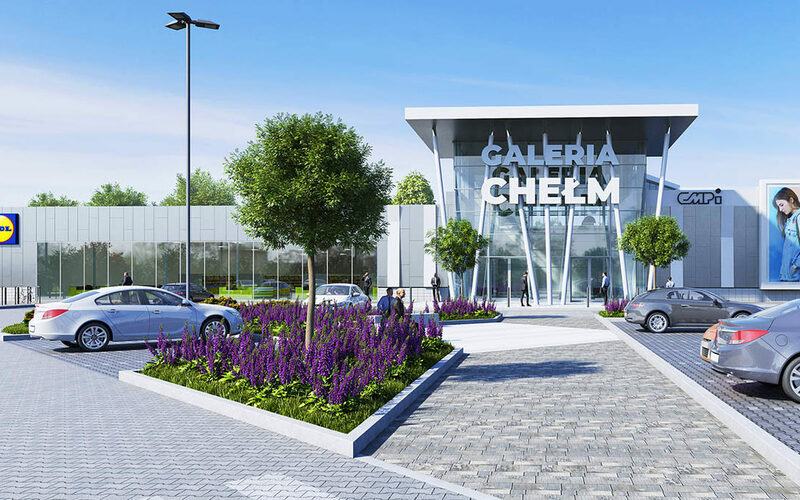 Galeria Chełm will offer its clients 55 stores on 17,500 sqm rental area and over 500 parking places. Chełm – perfect location for a shopping center. Chełm makes a unique place for a new shopping center. It is currently the only former voivodship city in Poland without a shopping mall. It also features an impressive catchment zone, covering nearly 300,000 inhabitants in the area of up to 45-minutes drive. Moreover, the catchment zone is significantly strengthened by the potential of cross-border traffic with the nearby Ukraine and Belarus. The plot on which Galeria Chełm will be developed constitutes another advantage of the project. It is located at the intersection of Lubelska and Rejowiecka streets (also constituting Chełm bypass), near Rondo Dmowskiego. It is a perfectly connected spot, being the main communication hub of the city. Many tenants of both Polish and international brands have long awaited the possibility of opening their stores at this point of the city. Inhabitants of Chełm and the region have also been waiting for a long time to enjoy a modern shopping center allowing for a variety of shopping and leisure opportunities without having to travel to Lublin, 70 km away. The application for a building permit for Galeria Chełm was submitted on April 27, 2018 and a final permit as well as project construction works are expected to start very soon. Planned opening in 2nd half of 2019. The construction project of Galeria Chełm is covered by the already signed joint venture agreement between Acteeum and a well-known international investor, operating in seven European countries. The process of project implementation is also prepared, and the planned opening will take place in the second half of 2019. Galeria Chełm will provide an excellent portfolio of tenants. It will provide an attractive balance between well-known global and international brands as well as local ones, recognizable in a given city or region and being often local phenomena. A year and a half before the opening, 68% of the commercial space has already been leased. Acteeum’s goal is to continue the commercialization successes achieved in previous projects. An excellent confirmation of the achievement was the VIVO! Krosno shopping center opened in October last year with the 100% lease score reached on the opening day. – The commercialization process of the shopping center, along its location and the format corresponding to the needs of residents in the catchment zone are the most important factors determining the future success of the project – says Mariusz Kowalczyk, Leasing Director at Acteeum Central Europe. The Acteeum approach to projects is based on extensive experience and knowledge of the polish market and the development process. The company is a business partner of large institutional companies, including CBRE Global Investors, Immofinanz, NepiRockcastle as well as private investors and family businesses. Acteeum focuses on the development of large scale retail facilities and residential projects.